Last month when I was in Cyprus, namely in the Sacred Metropolis of Morphou, I had the special blessing to meet saints who excelled in all areas of the spiritual life. It is worth saying a few words about Saint John Lampadistes, who is a Saint of the Church of Cyprus and lived in Byzantine times. According to testimonies he is an important Saint, not only in terms of holiness, but also historically, because he lived during the period when Cyprus was tested by the invasion of the Latins and Franks. This Saint has a special place in the hearts of Cypriots. He capitalized on his blindness with patience. His miracles are numerous, and mainly consist of cases where the ill suffered from demonic energies. But let us say a few words about his life. 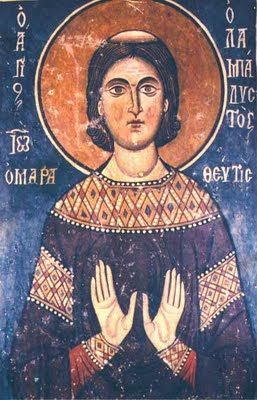 Saint John was born in Lampada during the reign of Nikephoros. His father was a priest named Kyriakos and his mother was named Anna. The Saint was a child with special gifts. His excellent level of education testifies to this, which was evident from his childhood. His parents sent him to the neighboring village to betroth a girl. But his in-laws hated him, so they bought fish, put poison inside, and they gave it to him to eat, with the result that he lost his vision. The Saint patiently endured this martyrdom always thanking God and practicing charity. He lived with such fortitude for twelve years, living his life in asceticism, purity, prayer, silence and theoria. One day, when the righteous one was about to deliver his soul to the Lord, he said to his servant: "My child, I see a golden-winged eagle flying around me, and by this I anticipate that tomorrow afternoon I will go the Lord." He further said to his servant: "Go to the vineyard and bring me a cluster, the best you can find!" The servant responded: "My lord, your father has not yet gone to the vineyard to read the prayer." But the righteous John wanted by this event to make known the will of God, Who was inside him. He said again to his servant: "Go on and bring me a cluster and do not be afraid." When his father at that moment saw this, he slapped him saying: "Blind one, why did you send your servant to cut grapes, before the prayer for the vineyard was given?" The Saint then ordered his servant: "My child, take the cluster you took and go back to the vineyard and stick it back from where you took it." The servant obeyed. By the intercession of the Saint and the grace of God the cluster stuck back at the spot where it came from. Seeing this miracle, the servant cried: "Lord have mercy!" When the servant returned he found the Saint dead, exactly as he told him, because it was afternoon. His relic was buried in the Church of Saint Herakleides. After a certain time some epileptics asked to find the grave of Saint John, saying: "Where is the grave of the holy and righteous John the Lampadistes, that we may venerate him and be healed?" His father, the priest Kyriakos, told them: "If you came here with cooperation from the Lord, then may it happen as you want." Then all those who saw the light at the tomb of the Saint gathered, and together with the two men they took hoes and opened the tomb of Saint John. Not only did they find his relic incorrupt, but also his heart, which they submitted to the Church of Saint Herakleides. The health of the epileptics was restored, and after thanking God and the Saint, they left. Since that time many and great miracles were done and are done for the people. Many who are blind have also received their sight. For this reason the faithful flock from across the universe to venerate his honorable relic. 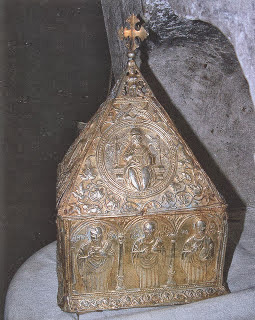 It should be noted that the skull of the Saint is kept in a silver gilt reliquary, which is among the oldest reliquaries in Cyprus dating to 1641. On it is depicted Archbishop Nikephoros bringing the imperial scepter, which is one of the symbols of the Autocephalous Church of Cyprus. Above the reliquary, on the wall, there are many signatures of pious pilgrims who went through there. 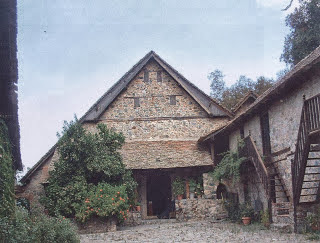 Especially of Karamanians, a group of people from Asia Minor who lived in the mountains of Karamania. They would go down to the beach in Kyrenia, at the Monastery of the Acheiropoiton Mandylion and they worked their way to Saint Mamas in Morphou. They would climb the mountains of Solea and arrived here to venerate Saint John the Lampadistes. Finally, the church that exists in the Monastery is singular, with an outstanding iconostasis of the late 16th century. 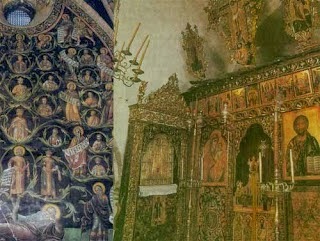 Under the Crucifixion is depicted the Twelve Feasts, from the 16th century, which looks very similar to the work of Theophanes the Cretan, whose Twelve Feasts are depicted in the Monastery of Stavronikita at Mount Athos, while the two big icons of the screen are from the period of the Turkish occupation. I want to thank Metropolitan Neophytos of Morphou, a lover of ecclesiastical art and tradition and a fighter for the rescue and renovation of churches in his Metropolis, for the information he gave me about Saint John, who is celebrated by our Orthodox Church on October 4th. The boast of Lampada and the pride of Cyprus, who was shown forth as a wonderworker, John our venerable Father. By fasting you utterly conquered the irrational thoughts of the flesh, therefore you grant the grace of healing from heaven, O divinely-inspired one. Glory to Him Who gave you strength, glory to Him Who crowned you, glory to Him Who works healings for all through you. Source: Ekklesiastiki Paremvasi, "ΟΔΟΙΠΟΡΙΚΟ ΣΕ ΠΡΟΣΚΥΝΗΜΑΤΑ ΤΗΣ ΚΥΠΡΟΥ: Ο ΑΓΙΟΣ ΙΩΑΝΝΗΣ Ο ΛΑΜΠΑΔΙΣΤΗΣ", January 2005. Translated by John Sanidopoulos.